A few days I suggested to take some profits as I was expecting a pullback and since then the Nasdaq has tacked on 55 points. Now we are in a environment where a believe a pullback is coming. Today was a nice payday in SWI so I decided to take those gains off the table and wait to see what the pullback in the general markets looks like in a week. If you were fortunate enough to hold on and stay in the market 2 days ago, today is a great opportunity to sell on strength. Be that trader who is smart enough to exit when the getting is good. 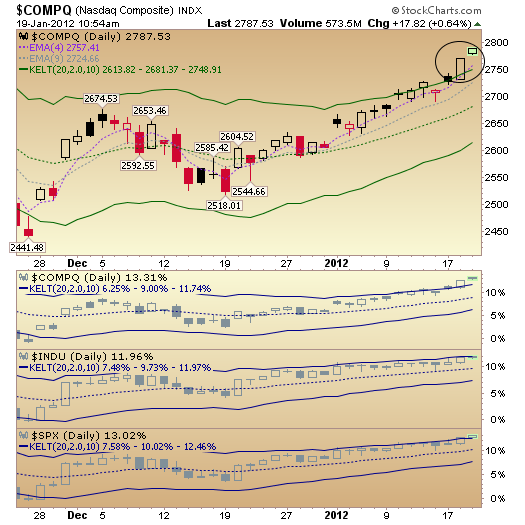 With today’s gap up, it’s a perfect scenario for a afternoon selloff as the 4ema has gone above the upper keltner channel. My targets to get back in a long trade on the indexes are below. Jeff, I picked up on your oversold/overbought using the keltner and 4 day a while back. I really like it. Just an FYI the last 3 times the 4 went over the upper keltner line the market corrected. July 7 to Aug 9th -19%. April 29 to June 16 -9%. Feb 18 to Mar 16 -8%. So let’s keep track of how much of a % it corrects this time. Right now the running avg is 12%. If you could remember to send a comment or email me at tradewithzen@gmail.com with the next correction numbers that would be great. Got a lot going on and I may forget, but I think there is something to keeping track of the correction percentages to get the average and then start scaling in then. Have you done any research on other markets other than Nasdaq where you found it too work? Bear with me here while I do my best to walk you through what I see. Is history repeating itself? Set up you charts with the keltner channel and ema 4. Take a look at May 2, 2011 to July 7, 2011. Notice on May 2 prices had peaked just above the upper keltner channel and then came a fall until June 16th. From there the market bounced and culminated with a blow off gap up on July 7th. This all came after a monster run up of about 10.6% in 14 trading days (June 16- July 7). If you compare this pattern to the pattern of Oct 27, 2011 to today you will notice some strange similarities in the patterns of ups and downs. We are now at the point where we are mirroring the blow off top from July 7th! And the run up to this blow off top stands at you guessed it, 10.6% which was achieved in 20 trading days. It took a few days longer than 14 trading days but don’t forget there were several holiday trading days which you can hardly count as full participation days. I’m a big believer in patterns and the repeating of patterns. If this pattern repeats you’ll see a pull back from today to about 2660. Then a bounce to 2755 only to roll over to take out the lows of Oct 4th. The start of the BIG rollover should begin in the beginning of February. Hey, call me crazy but it’s something to keep an eye on. Wasnt the NASDAQ above the keltner line almost the entire rally from Sep 10 to Feb 11 (excl Nov)? W/O going back and looking, I’m sure that does happen. Hence my reasoning for taking profits vs going short. Yes it could go up more, but I would say the odds are high we pullback. Every scenario and indicator has an exception. One other reason to think we’re going to pullback is no stocks showed up on my screens tonight, so breakouts are drying up.